The Southern Illinois University School of Dental Medicine (SIU SDM) is hosting an Open House from 11:30 a.m.-1:30 p.m. Thursday, Feb. 16 to showcase its renovated clinic on the Edwardsville campus. The clinic is equipped to provide a full scope of dental services, including preventive dentistry, cleanings, fillings, crowns and bridges, dentures, surgery, root canals and implant procedures. The clinic also is equipped to perform simple and complex pediatric dental care. It provides additional training laboratory space in support of the Clinical Certification Course of the SDM’s International Advanced Placement Program. 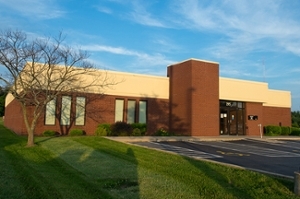 The Edwardsville clinic was originally built in 1997 to add additional program capability for the SDM. However after 10 years, it was necessary for the school to give up occupancy of the building for several reasons including rental costs, increased space availability in Alton and a need for consolidation. Following several years of leased occupancy by various businesses, the University reacquired the building. The $3 million project was funded from private donations, SDM Clinic Operation, SDM equipment use fees, Parking Services revenues for repairing and surfacing the parking lot, and University Plant funds. The clinic will open to the public beginning March 1. It is located at 195 University Park Dr.
Photo: SIU School of Dental Medicine Clinic on the SIUE campus.